As the highest authority, the shareholders meeting is entitled to make major decisions according to law, including operation policy and investment plan, approve of annual financial budget plan, final accounting plan, profit distribution and loss recovery plan, directors and supervisors election and replacement plan and determine their remuneration, amend the company articles, procedures of shareholders meeting, the directors and the supervisors, etc. The board of directors which is the operation decision center,are authorized by shareholders meeting. The Board shall operate and manage corporate assets and report to the shareholders. The Board is composed of 13 directors, including 1 chairman, 1 Vice Chairman and 5 independent non-executive directors (“Independent Directors”). The Board has 1 secretary. Mr. WANG Chang Shun, graduated from the University of Science and Technology of China with a Ph.D. in management science and engineering. He is currently the President and Deputy Party Secretary of China Southern Air Holding Company. He began his career in February 1976, served successively as Deputy Director, Director of Weather Safety Supervision Department of CAAC Urumqi Regional Administration; member of the Party Committee and Vice President of Xinjiang Airlines (Deputy Director of CAAC Urumqi Regional Administration); Party Secretary and Vice President of Xinjiang Airlines (Deputy Director of CAAC Urumqi Regional Administration). From November 2000, he worked as President and Deputy Party Secretary of China Southern Airlines Company Limited. From April 2001, he also worked as Vice Chairman of the board of China Southern Airlines Company Limited. From September 2002, he served as the Executive Vice President, member of the Leading Party Group of China Southern Air Holding Company, and Vice Chairman of the board, President and Deputy Party Secretary of China Southern Airlines Company Limited. From August 2004, he worked as the Deputy Administrator of the General Administration of Civil Aviation of China (later renamed as the Civil Aviation Administration of China). From March 2008, he served as the Deputy Administrator and member of the Party Committee of CAAC (Vice Minister Ranking); from October 2011, he worked as the President, Deputy Party Secretary of China National Aviation Holding Company; from January 2012, he also worked as Chairman of Air China Limited. In January 2014, he was appointed the Vice Minister and member of Leading Party Group of the Ministry of Transport. Since February 2016, he has served as the President and Deputy Party Secretary of China Southern Air Holding Company. He is also a representative of the 12th National People’s Congress. Tan Wan Geng, is an economist graduated from Zhongshan University,majoring in economic geography, with qualification of postgraduate degree. Mr. Tan began his career in civil aviation in 1990 and served as the head of the Infrastructure Department and Director of Human Resources and Administration Department of the Beijing Aircraft Maintenance and Engineering Corporation, the Deputy Director General of Human Resources Division (Personnel and Education Division) of the Civil Aviation Administration of China (CAAC), and has been the Director General and Party Secretary of Civil Aviation Administration of China Northeastern Region. He has been the Party Secretary and Executive Vice President of the Company from January 2006 to February 2007; the Party Member of CSAHC and the Party Secretary and Executive Vice President of the Company from February 2007 to January 2009; the Party Member of CSAHC and the President and Party Secretary of the Company from January 2009 to February 2009;the Party Member of CSAHC and the President and Deputy Party Secretary of the Company from February 2009 to May 2011. Since May 2011, Mr. Tan has been the Party Secretary of CSAHC and the President of the Company. Mr. Tan has been the Director of the Company since 15 June 2006 and has been the Vice Chairman of the Board since 24 January 2013. Yuan Xin An, received university education in Aeronautical Machinery from Air Force Engineer University and is a senior engineer. Mr. Yuan began his career in December 1976 and served as the Vice President of Engineering Department of China Southern Airlines Company, the Vice President of Guangzhou Aircraft Maintenance Engineering Co., Ltd., the Chief Engineer and the General Manager of Engineering Department of the Company. Mr. Yuan served as the Executive Vice President of the Company from April 2002 to September 2007; the Executive Vice President of CSAHC since September 2007; the Executive Vice President and Chief Legal Adviser of CSAHC since July 2008. Since 30 November 2011, Mr. Yuan has been the Director of the Company. Currently, Mr. Yuan is also the Chairman of Southern Airlines (Group) Import and Export Trading Company Limited, China Southern Airlines Group Construction and Development Company Limited, MTU Maintenance Zhuhai Co., Ltd., Dalian Acacia Town Villa Co., Ltd. and Shenzhen Air Catering Co., Ltd, and a director of China Aircraft Services Limited. Yang Li Hua, graduated with a master degree from the Party School of the Central Committee of CPC majoring in economics and management and is a senior expert of political science. Ms. Yang began her career in Air China International Corporation in 1973, and served as the head of the in-flight service team, manager of in-flight service division and deputy head of the Chief Flight Team of Air China International Corporation.Subsequently, she was appointed as the General Manager of the Passenger Cabin Service Division of Air China International Corporation in September 2000, the Vice President of Air China International Corporation in October 2002, the Vice President of Air China Limited in September 2004, and Executive Vice President of CSAHC in May 2009. From July 2010 to August 2012, Ms. Yang also acted as the Chairman of the Labour Union of CSAHC. Since January 24, 2013, Ms. Yang has been the Director of the Company. Currently, Ms. Yang is also the Chairman of Southern Airlines Culture and Media Co.,Ltd. Zhang Zi Fang, graduated with an Executive Master of Business Administration (EMBA) degree from Tsinghua University and is a senior expert of political science. Mr.Zhang began his career in 1976. He served as the Deputy Commissar and subsequently the Commissar of the pilot corps of China Northern Airlines Company; as the Party Secretary of the Jilin Branch of China Northern Airlines Company; as the General Manager of Dalian Branch of CSAHC Northern Airlines; as the Director of Political Works Department of CSAHC. Mr. Zhang has been the Deputy Party Secretary and Secretary of the Disciplinary Committee of the Company from February 2005 to December 2007. He has been the Executive Vice President and the Deputy Party Secretary of the Company from December 2007 to February 2009. Since February 2009, he has been the Party Secretary and Executive Vice President of the Company. Mr. Zhang has been the Director of the Company since 30 June 2009. Currently, Mr. Zhang is also the Vice Chairman of Southern Airlines Culture and Media Co., Ltd.
Li Shao Bin, graduated with a university degree from the Party School of the Central Committee of CPC majoring in economics and management and is an expert of political science. Mr. Li began his career in 1984, and served as the Deputy Head of Promotion Department of the Company, the Director of Political Department of Guangzhou Flight Operations Division of the Company, and the Director of Political Department and Deputy Party Secretary of Guangzhou Flight Operations Division of the Company. Subsequently, he was appointed as Party Secretary of Guangzhou Flight Operations Division of the Company in May 2004. Mr. Li served as the Party Secretary and Deputy General Manager of Guangzhou Flight Operations Division of the Company from March 2006 to August 2012. Mr. Li has been the Chairman of the Labour Union of the Company since August 2012 and the Director of the Company since 24 January 2013. Ning Xiang Dong, graduated from the Quantitative Economics Faculty of the School of Economics and Management of Tsinghua University with a doctor degree. Mr. Ning began his career in 1990 and served as the assistant, lecturer and associate professor at Tsinghua University and the Executive Deputy Director of the National Center for Economic Research (NCER) at Tsinghua University. He was also a visiting scholar at Harvard Business School, University of Illinois, University of New South Wales, University of Sydney and Chinese University of Hong Kong. Currently, he serves as the professor and the doctorate-tutor of the School of Economics and Management of Tsinghua University and the executive director of Centre for Corporate Governance of Tsinghua University. Mr. Ning has been the Independent Non-executive Director of the Company since 29 December 2010. He is also the independent director of Aerospace Hi-Tech Holding Group Co., Ltd. and Sichuan ChangHong Electric Company Limited. Liu Chang Le, was conferred an honorary doctoral degree in literature by the City University of Hong Kong and is a founder of Phoenix Satellite Television. Mr. Liu has been the Chairman and Chief Executive Officer of Phoenix Satellite Television Company Limited since 1996 and the Chairman and Chief Executive Officer of Phoenix Satellite Television Holdings Limited, a company listed on the Stock Exchange since 2000. Mr. Liu gained widespread recognition both locally and overseas for his enthusiasm for and achievements in the media industry. Mr. Liu is the recipient of numerous titles and awards, among which include “Wiseman of the Media Industry”, “the Most Innovative Chinese Business Leaders in the Asia Pacific Region”, “the Most Entrepreneurial Chinese Business Leaders”, and has been awarded the “Robert Mundell Successful World CEO Award”, the “Man of Year for Asia Brand Innovation Award” and the “Person of the Year” award of the Chinese Business Leaders Annual Meeting. Since 2005, Mr. Liu has been the Chairman of the iEMMYs Festival, which is run by the International Academy of Television Arts & Sciences. In November 2008, Mr. Liu received the International Emmy® Directorate Award. Mr. Liu was appointed as honorary chairman of “World Chinese-language Media Cooperation Alliance” in 2009 and appointed as special consultant to the 8th Council of the Buddhist Association of China in 2010. Mr. Liu was a member of the Tenth, the Eleventh and the Twelfth National Committee of the Chinese People’s Political Consultative Conference, served as the Vice Chairman of the subcommittee on Education, Science, Culture, Health and Sport of the Eleventh National Committee of the Chinese People’s Political Consultative Conference, and is serving as a member of standing committee of the Twelfth National Committee of the Chinese People’s Political Consultative Conference. Mr. Liu has been appointed a Justice of the Peace by the government of the Hong Kong Special Administrative Region. In July 2010, Mr. Liu was awarded the Silver Bauhinia Star by the Hong Kong Special Administrative Region. Mr. Liu has become an Independent Non-executive Director of the Company since 30 November 2011. Tan Jin Song, graduated from Renmin University of China with an on-job doctor degree in Accounting. Mr. Tan began his career in 1985 and was a teacher in Shaoyang School of Finance and Accounting of Hunan Province and the Deputy Dean of the School of Management of Zhongshan University; Mr. Tan acted as a professor of the School of Management of Zhongshan University from October to December 2008; and as the Party Secretary of the School of Management of Zhongshan University since December 2008. Currently, he is the independent director of Yihua Real Estate Co., Ltd., Sundiro Holding Co., Ltd., Grandhope Biotech Co., Ltd. and Poly Real Estate Company Limited. Mr. Tan also act as the independent non-executive director of Welling Holding Limited, the external supervisor of China Guangfa Bank and the independent supervisor of Sino-Singapore Guangzhou Knowledge City Investment and Development Co., Ltd.
Mr. Guo Wei, holds a master’s degree. He graduated from the Department of Management of the Graduate School of the Chinese Academy of Sciences (formerly known as Graduate School of the University of Science and Technology of China), majoring in management, and obtained a master’s degree in engineering. Mr. Guo has extensive experience in business strategy development and business management. Mr. Guo served as executive director and senior vice president of the Legend Group, vice chairman of the board of directors, president and chief executive officer of Digital China Holdings Limited ("Digital China"), and director of DigiWin Software Co., Ltd. At present, he is chairman of the board of directors of Digital China,and director of certain subsidiaries and associates of Digital China. He is also currently chairman of Digital China Information Service Co., Ltd., non-executive director of HC International, Inc.,independent director of Shanghai Pudong Development Bank Co., Ltd.,independent director ofTaikang Life Insurance Co., Ltd. and director of Kosalaki Investments Limited. In addition, Mr.Guo also serves as member of the 12th National Committee of the Chinese People’s Political Consultative Conference, member of the 4th Advisory Committee for State Informatization,chairman of Beijing Informatization Association and chairman of the 6th Council of China Non-Governmental Science Technology Entrepreneurs Association. Mr. Guo was awarded major prizes including China’s Top Ten Outstanding Youths (2002), Future Economic Leader of China(2003), and the First Annual China Young Entrepreneurs Creative Management Golden Honour (2005). He was also selected as one of the 50 Most Powerful Business Leaders in China by Fortune (Chinese version) in 2011, 2012 and 2013. Mr. Jiao Shu Ge, holds a master’s degree. He graduated with a bachelor’s degree from the Department of Mathematics of Shangdong University, majoring in control theory, and a master’s degree in engineering from the No. 2 Research Institute of Ministry of Aeronautics and Astronautics, majoring in systems engineering. Mr. Jiao has extensive experience in fund management and equity investment. Mr. Jiao is currently director and president of CDH China Management Company Limited (“CDH”). He is also the founder of CDH. Mr. Jiao was computer researcher of the No. 710 Research Institute of Ministry of Aeronautics, and deputy general manager of China International Capital Corporation Limited. He formerly served as nonexecutive director of China Yurun Food Group Limited, and non-executive director of China Shanshui Cement Group Limited. Currently, he is also director of associate companies of CDH,independent non-executive director of China Mengniu Dairy Company Limited, non-executive director and vice chairman of WH Group Limited, director of Joyoung Co., Ltd., vice chairman of Henan Shuanghui Investment & Development Co., Ltd., and director of companies including Beijing Taiyang Pharmaceutical Industry Co., Ltd., Chery Automobile Co., Ltd., Inner Mongolia Hetao Spirit Group Co., Ltd., Fujian Nanfu Nanping Battery Co., Ltd. and. Shanghai Qingchen Real Estate Development Co., Ltd.
Xie Bing , graduated from Nanjing University of Aeronautics and Astronautics, majoring in civil aviation management. He subsequently received a master degree of business administration, a master degree of international finance and a master degree in Business Administration (EMBA) from Jinan University, the University of Birmingham, Britain and School of Economics and Management of Tsinghua University, respectively. Mr. Xie is a senior economist. Mr. Xie used to work in the Planning and Development Department, Company Secretary Office of the Company and Office of CSAHC. He has been the Company Secretary since November 2007. since November 2007. There are Strategy and Investment Committee, Audit and Risk Management Committee, Nomination Committee and Remuneration and Evaluation Committee under the Board of the Company. Independent Directors shall occupy at least one half of the seats in the Audit Committee, Remuneration and Assessment Committee and Nomination Committee. The Audit Committee shall be entirely composed of independent members. Committees under the Board have formulated bylaws, which serve as a strict instruction for all performances. 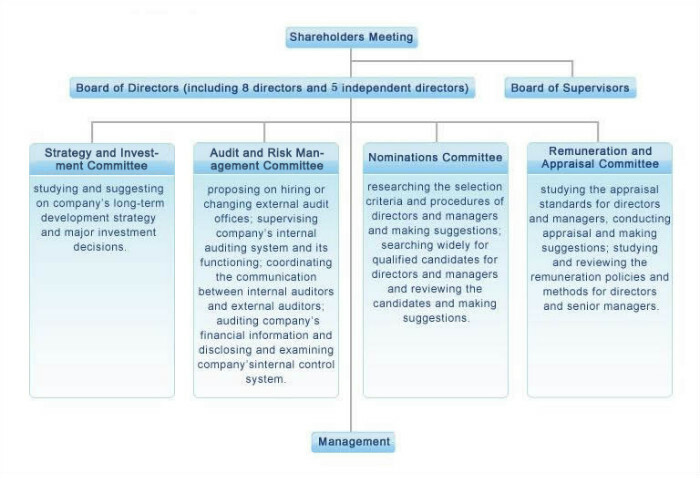 The Board of Supervisors is composed of shareholder representative supervisors, selected and removed by shareholders meeting, and employee representative supervisors, democratically selected by employees of the Company. The Board of Supervisors has 5 Supervisors and 1 Chairman, including two employee representative supervisors. No supervisors are served by Directors, General Manager, Deputy General Managers and CFO. Pan Fu, graduated with a master degree from Chongqing University majoring in power systems and automation, and is a senior engineer. Mr. Pan began his career in 1986,and served successively as the Deputy Chief Engineer of Test Research Institute of Electric Power Bureau of Yunnan Province and the Deputy Head of the Planning Department of Electric Power Industry Bureau of Yunnan Province (Group Company), the Deputy Director of the Planning & Development Department of Yunnan Electric Power Group Co., Ltd., the Deputy Director and Director of Kunming Power Plant, the Deputy Chief Engineer and Chief Engineer of Yunnan Electric Power Corporation, the Deputy Director and Director of the Department of Security Supervision of China Southern Power Grid Company Ltd., the Director of the China Southern Power Grid Technology and Research Center. He served as the General Manager and Deputy Party Secretary of the Guizhou Power Grid Corporation from January 2005 to November 2007, and served as the Director of the Planning Development Department of China Southern Power Grid Company Ltd. from November 2007 to November 2010. Mr. Pan has been the Team Leader of the Discipline Inspection Commission of CSAHC since November 2010 and the Chairman of the Supervisory Committee of the Company since 29 December 2010. Currently, he is also the Chairman of China Southern Airlines Group Passenger and Cargo Agent Company Limited. Li Jia Shi, graduated from Guangdong Polytechnic Normal University majoring in economics and mathematics and obtained an Executive Master of Business Administration (EMBA) degree from Tsinghua University and is an expert of political science. Mr. Li began his career in 1976. He served as the Deputy Head of the Organization Division of the Party Committee of the Company, Party Secretary and Deputy General Manager of Guangzhou Nanland Air Catering Company Limited, the Head of the Organization Division of the Party Committee of the Company, the Chairman of Southern Airlines Ka Yuen (Guangzhou) Aviation Supply Company Limited and Guangzhou Nanland Air Catering Company Limited. He served as the Deputy Secretary of the Disciplinary Committee and the Director of the Disciplinary Committee Office of the Company from December 2003 to December 2007. Mr. Li has been the Secretary of the Disciplinary Committee of the Company since December 2007 and has been the Team Deputy Leader of the Discipline Inspection Commission of CSAHC and the Secretary of Disciplinary Committee of the Company since February 2012. Mr. Li has been the Supervisor of the Company since 30 June 2009. Zhang Wei, graduated with a master degree from Tianjin University majoring in investment skills and economics and obtained an Executive Master of Business Administration (EMBA) degree from Tsinghua University and is a senior accountant. Ms.Zhang began her career in 1988 and served as the General Manager Assistant and Deputy General Manager of the Finance Department of the Company, the Deputy Director of the Supervisory Bureau and the Director of the Audit Division of CSAHC and the General Manager of SA Finance. Ms. Zhang served as the Deputy Director of the Supervisory Bureau and the Director of the Audit Division of CSAHC from October 2007 to October 2008. Since October 2008, she has been the Director of the Audit Division of CSAHC. Ms.Zhang has been the Supervisor of the Company since June 2008. Currently, Ms. Zhang is also the Chairman of Supervisory Committee of Southern Airlines Culture and Media Co.,Ltd, SA Finance, Southern Airlines (Group) Import and Export Trading Company Limited and China Southern Airlines Group Construction and Development Company Limited and the Director of Guangzhou Southern Airline Construction Company Limited. Yang Yi Hua, has a university degree, and is an accountant and an International Certified Internal Auditor. Ms. Yang served as the Manager of the Financial Office of the Company’s Financial Division, and Deputy General Manager of the Company’s Audit Department. Ms. Yang has been the General Manager of the Company’s Audit Department since May 2002 and the Supervisor of the Company since June 2004. Currently, Ms. Yang is also the Chairman of the Supervisory Committee of Guizhou Airlines, Guangzhou Baiyun International Logistic Company Limited, Beijing China Southern Airlines Ground Service Company Limited and Nan Lung International Freight Limited and the supervisor of Xiamen Airlines, SA Finance and Chongqing Airlines. Wu De Ming: graduated from South China Normal University majoring in political management. He obtained a degree after beginning his career from 1976. Mr. Wu served as the Director of the political division of Operation Department of China Southern Airlines, as the Deputy Party Secretary and Party Secretary of Guangzhou ticket office of China Southern Airlines, and as the Deputy Secretary and Secretary of the party general branch of ticket office of Transportation Department of China Southern Airlines. Mr. Wu served as the Director of the Disciplinary Supervision Department of CSAHC from March 2001 to December 2003; and as the General Director of the Supervision Bureau and Chief Officer of Disciplinary Committee Office from December 2003 to April 2009. He has been a member of Party Committee of Marketing Committee, Secretary to the Disciplinary Committee and President of the Labour Union since April 2009. Save as disclosed above, Mr. Wu De Ming has any relationship with any Directors, Supervisors, seniormanagement, substantial shareholders of the Company. General Manager and other senior officers shall organize operation and management of the Company. General Manager shall exercise his / her power according to laws, regulations, rules and Articles of Association of the Company as well as authority of shareholders meeting and Board of Directors. Mr. Xiao Li Xin, graduated from GuangDong Academy of Social Sciences with a master’s degree in economics and then obtained an Executive Master of Business Administration(EMBA) degree from Tsinghua University. He is a qualified senior accountant and a certified public accountant. Mr. Xiao began his career in July 1991 and served as the General Manager Assistant, Deputy General Manager, General Manager and Deputy Secretary of the General Party Branch of the Finance Department of China Southern Airlines Company Limited. He served as the Deputy Chief Accountant and General Manager of the Finance Department of China Southern Airlines Company Limited from March 2007 to October 2007. He served as the Director, General Manager and Secretary of the General Party Branch of Southern Airlines Group Finance Company Limited from October 2007 to February 2008. He served as the Director, General Manager and Party Secretary of Southern Airlines Group Finance Company Limited from February 2008 to March 2015. He concurrently held the positions of the Director and Vice Chairman of Air Union Insurance Brokers Co., Ltd. from March 2012 to March 2015.Mr.Xiao has been the Chief Accountant and Chief Financial Officer of the Company since 27 March 2015. Ren Ji Dong, graduated from Nanjing University of Aeronautics and Astronautics, majoring in aircraft engine design and obtained an Executive Master of Business Administration (EMBA) degree from Tsinghua University, and he is a senior engineer. Mr. Ren began his career in 1986 and served as the Deputy Director of Urumqi Civil Aviation Administration, the Vice President of Xinjiang Airlines, the Party Secretary and the Vice President of the Xinjiang branch of the Company, the Executive Vice President of the Company from March 2005 to January 2007, and the President of the Xinjiang branch of the Company from January 2007 to April 2009. He has been the Executive Vice President of the Company since May 2009. Wang Zhi Xue, has a university degree. Mr. Wang began his career in 1981. He served as the Manager of the Flight Safety Technology Inspection Division of Zhuhai Airlines Company Limited, Deputy Chief Pilot and Director of the Flight Safety Technology Division as well as the Vice President of Shantou Airlines Company Limited. He served as the General Manager of the Flight Management Division of the Company from October 2004 to February 2009 and the General Manager of the Flight Operation Division of the Company in Guangzhou from February 2009 to July 2012. Mr. Wang has been the Executive Vice President and Chief Pilot of the Company since August 2012. Mr. Wang is also the chairman of Zhuhai Airlines Company Limited. Mr. Li Tong Bin, received college qualification and graduated from Civil Aviation Institute of China majoring in maintenance of aircraft electrical equipment. He obtained on-job bachelor degree of Industry Electric Automation from Northeastern University of Technology, Master of Business Administration (MBA) from Hainan University and Executive Master of Business Administration (EMBA) from Tsinghua University. Mr. Li began his career in August 1983, and was the Head of Maintenance Plant of aircraft maintenance base, the Deputy Director and Director of Aircraft Engineering Department (aircraft maintenance base) of China Northern Airlines Company, the General Manager of Jilin branch of China Northern Airlines Company. Mr. Li served as the Deputy General Manager and Deputy Party Secretary of Zhuhai Airlines Company Limited from September 2004 to January 2005, and the General Manager and Deputy Party Secretary of Zhuhai Airlines Company Limited from January 2005 to April 2012, and the Party Secretary and Deputy General Manager of Northern Branch of the Company from April 2012 to April 2014. Mr. Li has been the Chief Engineer of the Company, the General Manager and Deputy Party Secretary of Engineering Department of the Company since April 2014. Mr.Li has been the Executive Vice President and Chief Engineer of the Company since September 2015. Zhang Zheng Rong, graduated with a college degree from the aircraft piloting major of Civil Aviation Flight University of China and then obtained an on-job Executive Master of Business Administration (EMBA) degree from Tsinghua University. Mr. Zhang is a CPC member and began his career in February 1982. He served as the vice leader of the Fifth Squadron of CAAC Sixth Flight Group, and the squadron leader, deputy group leader, group leader, and Deputy General Manager of the Flight Division of China Southern Airlines Company Limited, General Manager of Aviation Safety Supervision Department of China Southern Airlines Company Limited, and General Manager and Deputy Secretary of the Party Committee of Guangzhou Flight Division of China Southern Airlines Company Limited. He worked as Chief Pilot of China Southern Airlines Company Limited as well as General Manager and Deputy Secretary of the Party Committee of Guangzhou Flight Division in August 2007. He worked as Chief Pilot, COO Flight Safety and Director of the General Duty Manager Office of China Southern Airlines Company Limited from June 2012 to July 2012, Chief Pilot as well as Head of Aviation Security Division of China Southern Air Holding Company in July 2012, and Chief Pilot, COO Flight Safety and Head of Aviation Security Division of China Southern Air Holding Company in April 2014.Mr Zhang has been the COO Flight Operations of the Company since January 4th 2017. Su Liang, graduated from the University of Cranfield, United Kingdom with a master degree in Air Transport Management and obtained an Executive Master of Business Administration (EMBA) degree from Tsinghua University. Mr. Su was in charge of the flight operations, planning and international cargo project of the Company. From July 2000 to November 2007, Mr. Su was the Company Secretary of the Company. He has been the Chief Economist of the Company since December 2007. Currently, Mr. Su is also the director of Xiamen Airlines and Sichuan Airlines Corporation Limited. Chen Wei Hua, graduated from the School of Law of Peking University and obtained an Executive Master of Business Administration (EMBA) degree from Tsinghua University. He is a qualified lawyer in the PRC and a qualified corporate legal counselor. Mr. Chen joined the aviation industry in 1988. He served as Deputy Director, Director of the Legal Affairs Office of the Company. Mr. Chen has been the Chief Legal Adviser of the Company and Director of the Legal Department of the Company since January 2004. Currently, Mr. Chen is also the director of Xiamen Airlines. Guo Zhi Qiang, economist, graduated with a master degree from Party School of Xinjiang Uyghur Autonomous Region majoring in Business Administration. Mr. Guo began his career in 1980 and served as the Manager of Transportation Department of Xinjiang Airlines; the Deputy General Manager of Xinjiang Company of China Southern Air Holding Company; the General Manager of China Southern Airlines Beijing Office; the Deputy General Manager of China Southern Airlines Xinjiang Branch. Mr. Guo served as the Deputy General Manager of the Shenzhen Branch of the Company from December 2005 to February 2008 and the President and Chief Executive Officer of Chongqing Airlines Company Limited from February 2008 to May 2009, and served as the Deputy Director General of the Commercial Steering Committee of the Company since May 2009 and the Director General of the Commercial Steering Committee of the Company from September 2009 to September 2012. Mr. Guo was the COO Marketing & Sales of the Company and the Director General of the Commercial Steering Committee of the Company from September 2012 to July 2014. He has been the COO Marketing & Sales of the Company since July 2014. Currently, Mr. Guo is also the director of Xiamen Airlines Company Limited. Xie Bing, graduated from Nanjing University of Aeronautics and Astronautics, majoring in civil aviation management. He subsequently received a master degree of business administration, a master degree of international finance and an Executive Master of Business Administration (EMBA) degree from Jinan University, the University of Birmingham, Britain and Tsinghua University, respectively. Mr. Xie is a senior economist. Mr. Xie used to work in the Planning and Development Department, Company Secretary Office of the Company and General Office of CSAHC. He has been the Company Secretary of the Company since November 2007. Mr. Feng Hua Nan, graduated with a university degree from China Civil Aviation Flying College, majoring in aircraft piloting, and obtained an on-job master degree in Aeronautical Engineering from Beijing University of Aeronautics and Astronautics and an Executive Master of Business Administration (EMBA) from the School of Economics and Management of Tsinghua University. He is a commanding pilot. Mr. Feng began his career in 1983. He served as the Director of Zhuhai Flight Training Centre of China Southern Airlines Company Limited, the Deputy General Manager of Flight Operation Division, the General Manager of Flight Safety Technology Department and the General Manager of Flight Technology Management Department of China Southern Airlines Company Limited. Mr. Feng served as the Party Secretary and Deputy General Manager of Guizhou Airlines Company Limited from September 2004 to February 2006, and then served as the Director and General Manager of Guizhou Airlines Company Limited from February 2006 to July 2014. Mr. Feng has been the COO Flight Safety of the Company since August 2014.Currently, Mr.Feng is also the Chairman of Zhuhai Xiang Yi Aviation Yechnology Company Limited,Southern Airlines General Aviation Company Limited and China Southern West Australian Flying College Pty Ltd.
Yang Ben Sen, graduated with a college degree from the aircraft piloting major of Civil Aviation Flight University of China. Mr. Yang is a CPC member and began his career in December 1978. He served as the squadron leader and head of the technology section at the Ninth Flight Group of CAAC, deputy group leader and group leader of the Flight Group at CAAC Urumqi Administration, and General Manager and Deputy Secretary of the Party Committee of the Flight Group at CAAC Urumqi Administration. He worked as General Manager and Deputy Secretary of the Party Committee of the Flight Division of Xinjiang Airlines in January 2002, Deputy General Manager of Xinjiang Branch of China Southern Air Holding Company in December 2002, Member of the Party Committee and Deputy General Manager of Xinjiang Branch of China Southern Airlines Company Limited in January 2005, and Member and Secretary of the Party Committee and Deputy General Manager of Xinjiang Branch of China Southern Airlines Company Limited in July 2005.Mr Yang has been the Chief Pilot the Company since January 4th 2017. Guo Jian Ye, Mr. Guo have an on-job master degree from the Party School of the Central Committee of CPC. Mr. Guo graduated from the aircraft piloting major of Civil Aviation Flight University of China, and obtained an on-job bachelor's degree in political education from Department of Morality Education and Management of South China Normal University, and then a master degree in economics and management from the Correspondence School of the Party School of the Central Committee of CPC. Mr. Guo is a CPC member and began his career in May 1980. He served as Secretary of Youth League Committee and Deputy Director of the Propaganda Department of CAAC Central South Regional Administration, Director of Political Office and Deputy Director of Air Traffic Management Bureau of CAAC Central South Regional Administration, General Manager of Guangdong Central South Civil Aviation Industrial Co., Ltd., Deputy Director of CAAC Hainan Safety Supervision and Administration Office, Director of CAAC Henan Safety Supervision and Administration Office, Head and Secretary of the Party Committee of CAAC Henan Safety Supervision and Administration Bureau, and Standing Member of the Party Committee and Deputy Head of CAAC Central South Regional Administration. He worked as the Member of the Party Committee, General Manager and Deputy Secretary of the Party Committee of Heilongjiang Branch of China Southern Airlines Company Limited in July 2012; he worked as the Member, Director and Deputy Secretary of the Party Committee of the Marketing and Sales Steering Committee of China Southern Airlines Company Limited in July 2014.Mr Guo has been the Chief Service Officer of the Company since January 4th 2017.